I realized that I haven't mentioned a single word on this here blog about exactly how I'm doing with my 12 in 2011 goal. Well, let me tell you, considering that we're just starting the ninth month of the year and I've got 11 finished projects under my belt with four more months to finish another one...I'd say I'm doing pretty dang good! Don't you think? I think it really helped me out that I was averaging a project a month and got myself ahead of the game by getting two projects done in the month of February, and then completing the baby sweaters back in May. 1. Phinney pullover - just needs the pieces blocked, sewn together, and the collar picked up and knit. 2. Emelie cardigan - needs sleeves and button bands. I know, I have 2 projects in progress for this goal but I have stalled so much on the Phinney pullover that I added the Emelie cardigan for insurance. Just in case. One of them is bound to be #12. I do have a few bunch of back ups in case either project doesn't work out. I think the first 30 patterns in my Ravelry queue have been there for quite a while and the yarns in the stash for them have been there for just as long. I'm loving how this 12 in 2011 goal is making me knit from stash and using patterns that have been in the queue since the beginning of Ravelry. After I finish my last FO for this goal I think I'm going to make it my new goal to try to knit through my queue and hopefully dwindle the list down a bit. I should also actually go through my queue and delete patterns that don't suit my tastes or know that I will never knit/wear. Knowing that I still have four months to get that last project done, I feel like I can veer off the 12 in 2011 path for a bit and knit with newly purchased yarns. 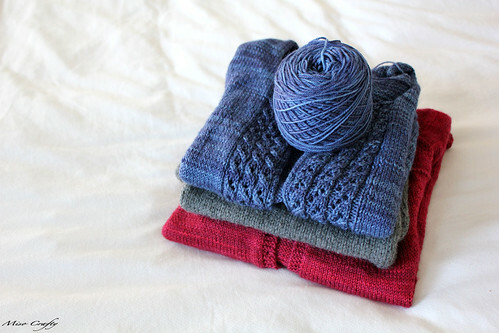 * I'm simply calling these baby sweaters as they have yet to be given to the recipients and have yet to be blogged about.